The future may seem to be closer or farther off, depending on the era you're living in. That's one of the possible conclusions you can draw from this chart (embedded below), created by Stephanie Fox for io9, based on research we've done over the past month. We wanted to know whether there are historical trends in how far in the future we set our science fiction — and there definitely are. Here we present our data, as well as some preliminary conclusions about why the future changed so much from decade to decade over the past 130 years. Infographic I'd like to see: How far ahead did we set our science fiction at various points in history. That would be interesting. Please click charts below to expand. Once we had our data, we divided it up into works set in the Near Future (0-50 years from the time the work came out), Middle Future (51-500 years from the time the work came out) and Far Future (501+ years from the time the work came out). Why did we pick these boundaries? In part they were just necessary (and slightly arbitrary) cutoffs for categories that are arguably much softer than such rigid demarkations can capture. Still, they are justified for a few reasons. First of all, I wanted to reflect an idea of "near future" SF that encompasses works that are set just barely into the future, works that are generally intended to be about how the present day is already science fictional. George Orwell's 1984 was probably the first work of SF to popularize this notion of the near future, while William Gibson and Ken MacLeod's recent works also take it up. I picked 51-500 as the "mid future" because, frankly, it includes the Star Trek universe, which I consider to be a kind of model of mid-future SF because it includes radically new technologies and social structures, but the world is still recognizably our own. There is a ton of science fiction set in this mid-future which functions similarly - we're still the same old humans, just in space. And finally, works set 500+ years in the future are often of a markedly different character than mid-future ones. We see a humanity that's radically altered, like the one in The Time Machine or Alasdair Reynolds' series. The Earth is unrecognizable or long gone. This is Deep Time territory, when anything goes. Some caveats: I thought about making Near Future 0-100 years in the future, but decided that generally once you get beyond 50 years you start seeing SF that includes really radical changes and isn't intended to be "five minutes into the future" like recent William Gibson novels or George Orwell's 1984. I also thought about adding another "mid future" category between 51-200 years, since that's such a popular time period. If we had more data, I think that would have been reasonable. I would like to say at the outset that these conclusions are preliminary, as we'll need a lot more data before we're on solid ground — and I would also like to see some cross-cultural comparisons, too. There are, however, a few things we observe right off the bat. There are a few moments in history when all futures are almost equally represented, notably in the 1920s and the 1960s. Those are both periods of liberalization in the United States, when social roles were changing rapidly and the economy was booming. Perhaps these eras of rapid change turned people's eyes to both the near and far future. Interestingly, both eras were followed by periods of economic downturn that led to opposite effects: In the 1930s, we saw a spike in far future stories (indeed, the most of any era in our data); and in the 1970s we saw a spike in near future stories. At other times, the future seems right around the corner. 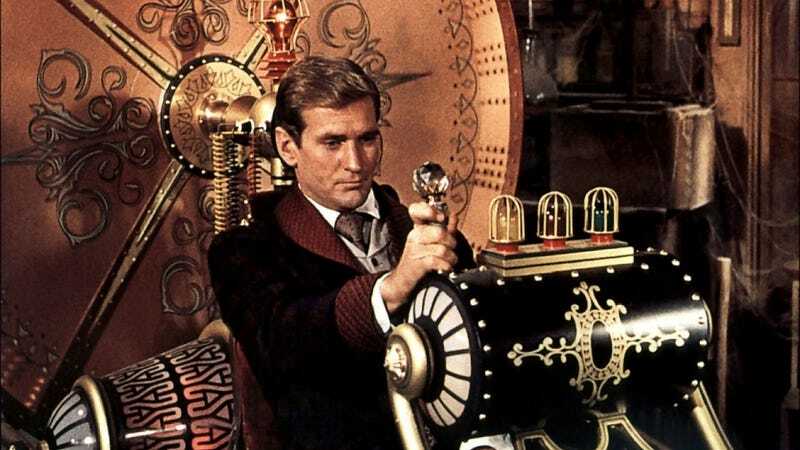 In the 1900s and the 1980s, there were huge spikes in near-future science fiction. What do these eras have in common? Both were times of rapid technological change. In the 1900s you begin to see the widespread use of telephones, cameras, automobiles (the Model T came out in 1908), motion pictures, and home electricity. In the 1980s, the personal computer transformed people's lives. In general, the future got closer at the end of the twentieth century. You can see a gradual trend in this chart where after the 1940s, near-future SF grows in popularity. Again, this might reflect rapid technological change and the fact that SF entered mainstream popular culture. The future is getting farther away from us right now. One of the only far-future narratives of the 1990s was Futurama. Then suddenly, in the 2000s, we saw a spike in far-future stories, many of them about posthuman, postsingular futures. It's possible that during periods of extreme uncertainty about the future, as the 00s were in the wake of massive economic upheavals and 9/11, creators and audiences turn their eyes to the far future as a balm. Again, these are all speculative comments. More data and analysis are needed. Research by Ben Vrignon and Gordon Jackson.